Manufacturer of Anthelmentic products used for treatment of gastro Intestinal Parasites like worm, which leads to other infections. 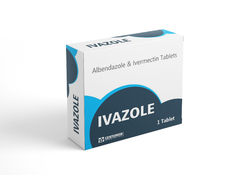 Albendazole Ivermectin Tablet is used for Parasitic infection of the skin, Parasitic nematode worms intestine infections, Parasitic filarial worm infection, Neurocysticercosis, Enlarged limb, Threadworm infection, Threadworm infections, Whipworm infection, Pinworms infections, Inflammatory diseases and other conditions. Albendazole + Ivermectin tablet is an effective Anthelmintic agent. This comes as a chewable tablet.